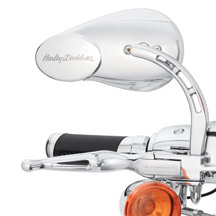 What could be better than genuine Harley-Davidson chrome accessories with style and safety in mind? I first heard about these mirrors from our HOG chapter’s Safety Officer who recomends them to everyone who rides an Ultra Classic. When I asked our Head Road Captain if he had heard about them, he told me he has them on his bike and they’re great. 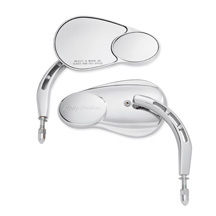 The Harley-Davidson Split-Vision Mirror Kit part# 92190-06 is not only stylish; it is designed to reduce blind spots. This mirror features a large primary panel for normal viewing and a second smaller outboard convex panel for a wider field of vision. Many of you use convex mirrors on your SUV’s and pick-up trucks. Why not use them on your motorcycle? When using these mirrors, I find that I can see traffic over my shoulder in the opposite lane. For example: I can see cars passing me on the left in the right hand mirror. I’m told these mirrors are especially helpful on the Ultra Classic models where many riders find they see too much of the elbows and shoulders of their passengers thus obstructing their view of traffic. These mirrors look great and give you an edge when it comes to safety and I’m looking for every advantage I can get. I highly recommend these mirrors; they retail for $119.95 at your local Harley-Davidson dealer. Stay tuned to RC USA for reviews on practical motorcycle parts you can put to good use. I actually saw these on a bike this weekend. They are good looking mirrors. I purchased these over a year ago and really like them. They took a couple of rides to get comfortable with them and after that I like the field of vision they provide. I would put these on my bike if they would fit. Pretty swank. Great idea. Funny I’ve never seen them before this. Don’t really have any pertinent comments. Just wanted to offer greetings. Greetings Dan, I was excited to see you left a comment. Thanks, always glad to know you stopped by. My wallet is a bit lighter tonight as I had to run out and buy my wife those mirrors. Dave, these mirrors supposedly fit all ’82 and later HD models except for the V-Rod. I have seen them on a Heritage, a Dyna, and several Ultra Classics. They should fit your Street Glide too. Looks like a great idea. I havent seen them on any bikes yet though. They look great too. Have you heard any complaints about the stem not being long enough? I’ve heard that some riders prefer the after market – with longer stems? These look great – ready to purchase – we use on all of our cars and they are very helpful! I have seen a few riders use these in conjunction with HD extenders that raise them up just a few extra inches.